My grandmother began working as the cook for a doctor’s family in the small town near their farm when she was 18. Her brother was the family’s chauffeur. It was a very small town. I’ve always been bemused that the family had servants. My grandmother was a very good cook. She had a large family who could always be assured of tasty meals when they visited for a weekend or a week. Grandma had a large garden. She canned, froze blueberries and the fish Grandpa caught, and ordered 20 pounds of flour at a time for the six loaves of bread she baked every Monday morning and the pies she baked several times a week. I have the records of my grandmother’s cooking: recipes she saved which she annotated, newspaper clippings, and ads she cut out of magazines for products she must have wanted to try. There are recipes written in other hands sharing a dessert or bread or salad enjoyed when everyone got together for a meal. It was the late Sixties when more and more of those recipes called for a cake mix. Betty Crocker. Duncan Hines. Pillsbury. Each of those cake mixes had a persona who helped to sell the brand. Duncan Hines was a real person. Betty Crocker was not. And the Pillsbury Dough Boy …. I am grateful for the book Finding Betty Crocker. 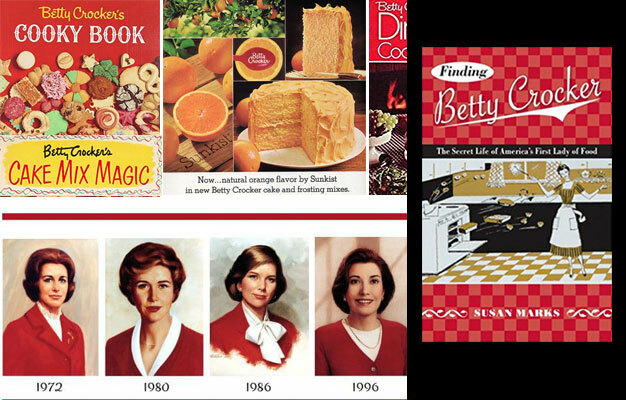 Author Susan Marks shares how the marketing techniques developed that would make Betty Crocker one of the most well-known brands—and women—in the country. It’s a wonderful, chatty, eye-opening book about marketing and the anthropology of women’s lives in the United States. I once had our marketing book club read the book and it engaged us in conversation for hours. It’s eye-opening.